Every one of us were created in the image of God, the Lord of the Universe. One aspect of this image is the eternal nature of our soul. God is eternal- He is from everlasting to everlasting. He had no beginning and he will have no end. Surprisingly enough, neither will we! That's right- neither the unsaved soul, nor the born-again soul will have an ending; the soul is eternal, made in the image of God. From this truth we can determine that we must spend eternity somewhere. Heaven is one of the two alternatives. 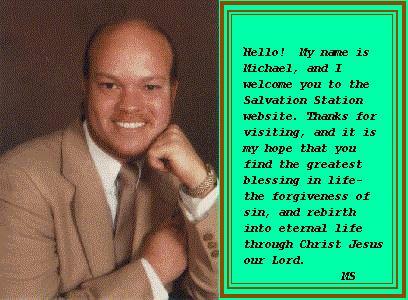 It is only for those who have found salvation in the cleansing blood of the Lord and Saviour Jesus Christ. But as it is written, Eye hath not seen, nor ear heard, neither have entered into the heart of man,the things which God hath prepared for them that love him. The astounding thought here is that all of us during some part of our lives have experienced beautiful experiences. In this life, I have seen very beautiful things, I've heard very beautiful music, and in my heart have touched on the spirit of love, which I am thankful for. But- this scripture says that nothing we have experienced can come close to the wonderful things God has prepared for we who love him. Hallelujah! Think back over your own life to the nicest, feeling that you have ever had. The highest point of joy, the deepest feeling of love, the happiest moment, the most pleasant thought. The most peaceful suroundings that you knew. These, my friend, do not even come close to the things which are waiting for you in the Kingdom of God if indeed you have been born from above. And the best part about it is that these glorious things awaiting you are eternal. The scripture that we are looking at -- 1st Corinthians 2:9 states that the concept of what is prepared for we who believe, has never entered into our hearts. One way to grasp this fact is to look at another verse of scripture revealing the awesome vastness of God's being. 9 For my thoughts are not your thoughts, neither are your ways my ways, saith the LORD. 10 For as the heavens are higher than the earth, so are my ways higher than your ways, and my thoughts than your thoughts. ... or whatever was enjoyable. One fact about Heaven rarely mentioned is that all of the unspeakable joy that awaits the people of God there, will never stop increasing. That's really hard to imagine, but these two scriptures from Isaiah chapter 9 hold an ASTOUNDING truth about the glorious future ahead for born-again believers in Jesus Christ. This passage is of course, a major prophecy about the coming of Messiah Yeshua into the world and the establishment of His everlasting kingdom. In verse 7, it reads "of the "increase" of his government and of PEACE there shall be no end." The thought follows, when the Lord will come and take us to meet with Him in the clouds, of how our JOY will be so full, never having experienced it at that level. But -- if that joy never stops INCREASING through eternity future, what level will we be at in 10,000 of what we used to call years! Hallelujah! Can you imagine that? Ever increasing JOY?! Not just never ending... but ever increasing! 3. Comparision to a Drug Induced "High"
When a person uses drugs to satisfy their flesh, first there is a question as to whether the drug itself is of 'good quality' that will satisfy. Usually, this becomes the first let down of the experience, however, later -- the user develops a tolerance to the drug no matter how 'good' it was so that it no longer satisfies like it used to. That is the second letdown. Then times exist when the user cannot "score" at all, at which time he or she remains unfulfilled.. HEAVEN won't be like this! HEAVEN will start out a million times greater in fulfillment that one could ever imagine. We will be in the presence of Almighty GOD, Himself. We shall behold Him -- the Lord Jesus Christ, who is the Creator of all things. We will NEVER be separated from Him again but will for all eternity dwell in the brightness of His glory. After this we have the promise of Isaiah 9:7 that the initial peace, will never stop increasing.. What a way to exist! What a way to spend an eternity! This is probably one of the two most staggering concepts of eternal life in Christ Jesus. The physical and spiritual wonders of the glory of Heaven are listed in the final chapters of the Revelation -- numbers 21 and 22. Streets of gold are mentioned, a new city prepared especially for the church of Jesus Christ, no more tears and much more. However, Genesis 15:1 tells us the main substance of what our eternal rewards consist of. He is our reward -- an exceeding great one! He is the Lord God Almighty, the Lord Most Holy, and the Creator of all things. Think of the implications of seeing the face of God! I remember an earlier account of scripture where the *opposite was true. Look at this following experience of Moses with God. Think of it friend! A man would drop dead upon laying eyes on the glory of God. John passed out on the Isle of Patmos when he viewed the Revelation of the glorified Christ! The Roman guards who guarded the tomb of Jesus passed out when they saw the appearance of the angel who rolled the stone away- and that was just an angel! When Moses went up on Mount Sinai to talk with God, the Hebrews at the base of the mountain were TERRIFIED at the presence of the LORD! But- we who are in Christ, will look directly into the face of GOD, forever! If our LORD did not prepare us a special body, we would never be able to stand it the glory of His presence. We wear flesh that decays at death, but in the resurrection we will put on that which does not perish. What will be the glory of this new *spiritual body? What an awesom truth! "We shall be like Him"? Friends- have you ever seen the description of the angel whom John (at Patmos) saw in the Revelation? He passed out by just gazing at the glory of the Lord! "We shall be like Him"? It's probably the only way we can exist in His presence! Well, again it's just how far your imagination can take you. I don't know what state we will be in, but it will be glorious. 3 And if I go and prepare a place for you, I will come again, and receive you unto myself; that	where I am, there ye may be also. The point here is that it is Jesus Christ who created us, therefore as far as heavenly rewards are concerned- it is He who really knows how to satisfy. He made the bodies we now have. He will create the bodies that we are going to receive. Who knows better how to satisfy? Who knows better how to fulfil but He who made us? It is this same Jesus, who has gone to prepare a place for us as shown in verse 3 above. How glorious it will be whatever way He has prepared for us to behold His eternal glory! Matthew 6:20 But lay up for yourselves treasures in heaven, where neither moth nor rust doth corrupt, and where thieves do not break through nor steal. ...or about seeing His face! Revelation 22:4 And they shall see his face; and his name shall be in their foreheads. "Even so, Come, Lord Jesus!"